"I've fallen in love with the idea of living." "Zest a kind of zeal or enthusiasm. If you've got a zest for something, you put your whole heart and soul into it. Dancers who have great zest leap, kick, and soar their way around the stage with a kind of joyful energy. 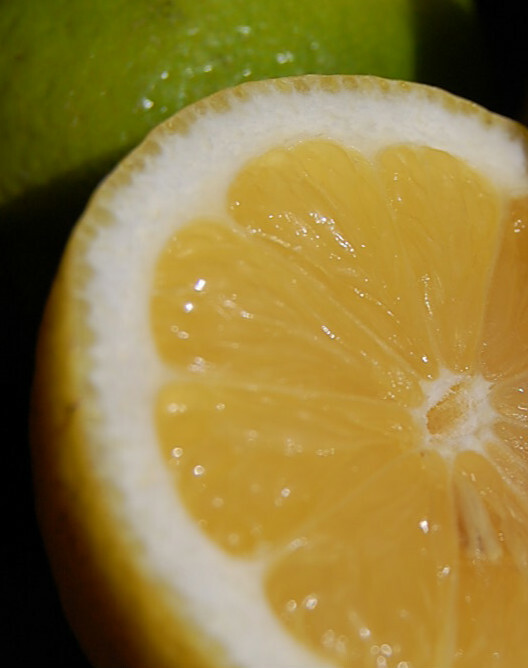 Oddly enough, zest can also be the outer peel of a lemon or orange, which chefs scrape into their dishes when they want to add some tartness and tanginess to a recipe. People who live with that same kind of spice are said to have a "zest for life." In other words, they live their lives with a lot of flavor and gusto. A student who has a zest for learning dives into her books with an enjoyment and relish most people reserve for their wedding day." Many of us have times when we feel that we have not yet lived our lives. In Open Horizons (process) theology, this very feeling can be an opening for spiritual growth. God is not a dictator beyond us, say process theologians, God is a poet within us. She is also the indwelling Poet of the hills and rivers, the trees and the stars. Always this Poet is beckoning us to become as alive and attentive as we can be. In times of self-doubt or stagnation, our inner Poet invites us to claim our own lives, to fall in love with life itself. Thus we learn from Frederic and Mary Ann Brussat in Spiritual Rx: Prescriptions for Living a Meaningful Life. For them "spirituality" is the activity of becoming fully alive, fully human, and it has many forms. They offer an interfaith spiritual alphabet that identifies thirty seven modes of aliveness; see their Spiritual Rx Prescription Chart. 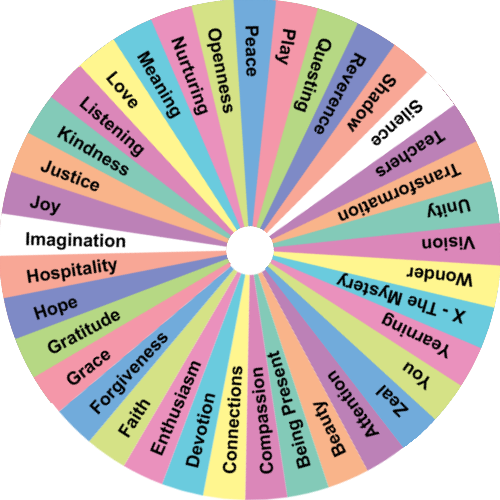 See the Wheel of Spirituality at the top of this page. ​Zeal is their name for falling in love with life. Spring is a time to remember the practice of zeal, falling in love with life itself. The Brussats remind us that Zorba the Greek and Shirley Valentine offer images of what this can be like, as does "To Life" in Fiddler on the Roof. Our vocation, among other things, is to find our inner Zorba, our hidden Shirley, our Fiddler waiting to be born, each in our way. Somewhere deep within the human breast there is a call, a plea, a yearning for us to say, to ourselves and to others: L'Chaim (To Life). ​​Some people love justice but they do not love life. They love their neighbors but not themselves. The coming of spring is an invitation to fall in love with the idea of living your own life and, along the way, to embrace the life of the senses. The idea that the body is a gift is very un-platonic but very biblical. In the biblical traditions the human self is not a disembodied soul but rather a whole person: spirit, body, and mind. The spirit is not apart from our bodies; it is in our minds as our passion for life, and in bodies as the healing and creative source of vitality. Even God is embodied in a way. God feels what happens in the universe, not unlike the way we feel what happens in our own bodies. The universe itself is God's body. Claiming our bodily lives is especially important for those of us who feel stagnant, as if our own creativity and passions have been lying in a deep freeze. We are not sure how our creativity and passions got into the freezer. Did others place them there? Did we put them there ourselves? One way or another a part of us is frozen. Then some spring. 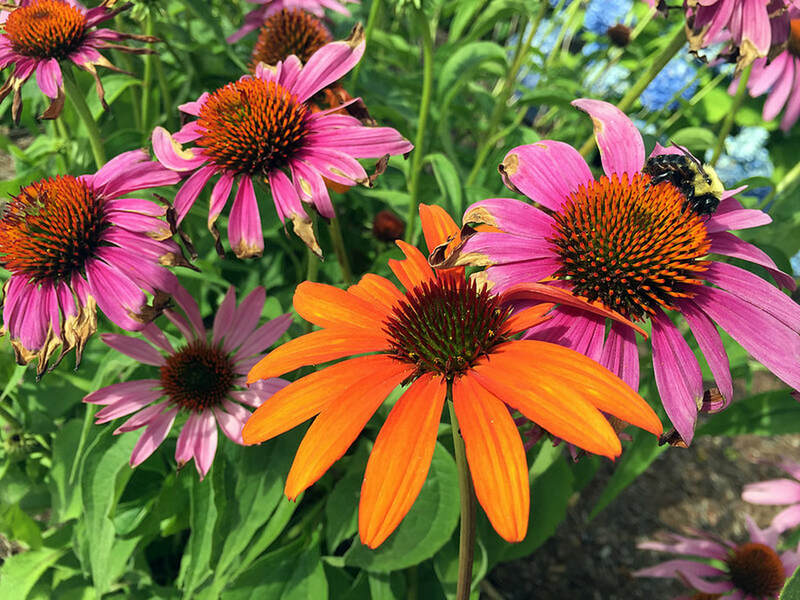 We see the bursting forth of the flora and fauna; and, like Shirley Valentine, we find ourselves inwardly lured by the “idea” of living their lives. We feel the possibility of claiming our passions, of living our lives, of being fully alive. There's some process theology in all of this. The very attractiveness of the idea of living our lives is God’s presence in our lives. It is God’s commandment to Enjoy. Of course there are other commandments, too, such as the commandment to be compassionate and do justice. God’s commandment to enjoy is part of larger call that all living beings -- people, animals, and the earth -- find some kind of happiness. God's hope is for mutual enjoyment and, indeed, a co-enjoyment in which God shares. But some people are better at responding to a call toward justice than to a call toward joy. The very desire to do justice can come from fear not love; the very act of loving one's neighbor can come from a hatred of oneself. Such fear and hatred are the very opposite of what God wants for the world. They are sins. But God is not in the business of reward and punishment. Like a loving sister, God wants us to be happy. God finds God’s way into our hearts as the commandment to find a little table by the edge of the sea and have a glass of wine. Sitting at the table, with or without friends, we find find our inner Shirley Valentine. She is one of God's faces. She has been waiting there for us all the while, just outside the freezer, saying: "Here I am, your very life, claim me." "It's a terrible feeling - the sense that your life is passing you by, the awareness that your unique self has not come forth. How does it happen? And what countermeasures can you take? We forfeit life by denying the spirit that is within us. We throw away everything when we don't join the parade because we are too busy, too tired, or too jaded. The unlived life is one we have squandered by passivity, by only trying to prove ourselves to others, or by only seeking to fulfill societal expectations...In contrast to all this, there is the passionate life. Practice zeal and embrace all that comes your way with an open and full heart." "The spiritual practice of zeal means being fully aroused by life. We tap into the divine energy that pulsates within us and around us. We are ready for anything that comes our way, and every moment is a gateway to new possibilities...This spiritual practice includes a wholehearted delight in the senses and a passionate love for who we are and what we have been given."